Does your studio have a referral program that rewards past clients who have referred future business to you? Even if you don’t offer “rewards” for referrals, it’s something you likely still want to keep track of. You can do that right inside Táve with this simple method described below! 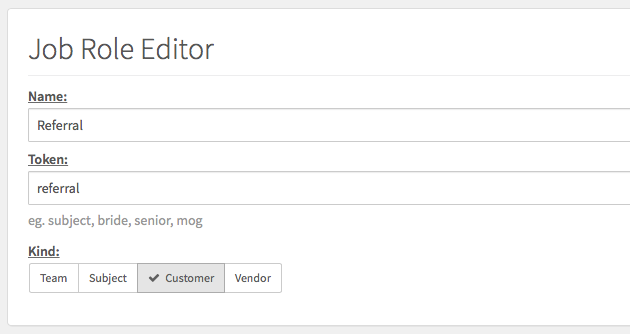 The first step in tracking referrals in Táve is to add a custom job role on your account Job Role Settings page. Simply click Create New and add a role named Referral of the subject kind. On your new leads that come in, if they mention the name of the individual who referred them your way, add a contact to their job tied to this new Referral job role. You’ll notice that if you start typing in a name for a referral who happens to be already in your address book, it will predict the person’s name below for you to select. For the most accurate tracking, it’s important that you select the predicted listing where appropriate, rather than continue to type in the existing contact’s name to avoid a duplicate address book entry. Once added as a new contact on the lead/job, you’ll see this person added to the lead/job worksheet as the referral source. Once a person is tied to a job as a referral using this new job role, you can track all of the booked jobs they’ve sent your way by simply glancing at the Leads & Jobs tab of their contact card in your Táve address book. If you have a system in place where you reward your referral sources with credit or maybe you just want to send them a simple thank you email, you can now work this into your workflows for all of your job types. I add a task in all of my job workflows that reminds me to reach out to the referral at a particular time to thank them and notify them of their referral rewards. If you have come up with a creative way to track job referrals, or to manage anything else in Táve, be sure to let us know. We’re happy to share some tips from our users!